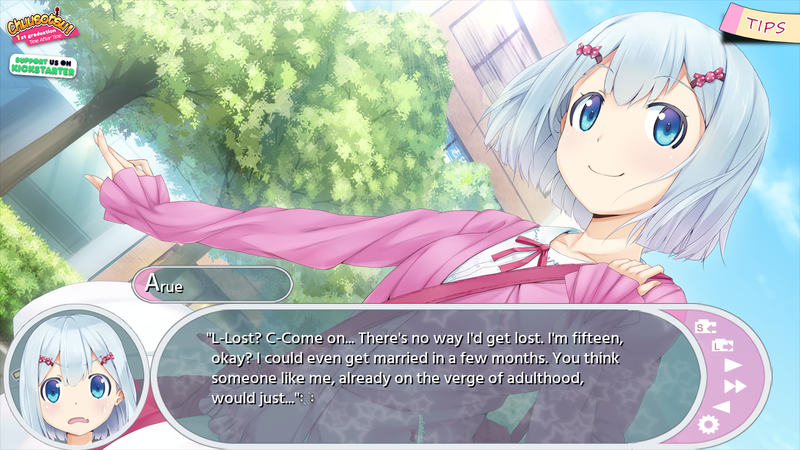 Fruitbat Factory is bringing you Chuusotsu - 1st Graduation: Time After Time, a colorful new visual novel by Studio Beast. 589 backers pledged $24,104 to help bring this project to life. We are funded! Thank you for the support! Second stretch goal unlocked! All 4 new CGs rewards from this campaign are open! Side Story will be unlocked at $26.000 funding and added to all game pledges for free! Check the Updates section for more campaign updates. Chuusotsu - 1st Graduation is a new all-ages visual novel by Studio Beast, famous for the cult classic J.Q.V Jinrui Kyuusai-bu ~With Love from Isotope~. It was released in Japan in August 2016 as a HD wide-screen release. The funding from the project helps to cover the localization costs for Chuusotsu - 1st Graduation, and allows Studio Beast to further improve the game, as well as supports them on their future projects, so they can keep making excellent games! Koiro has a fierce reputation, but...? As a backer, this is your chance to get the game significantly under the retail price (MSRP for Chuusotsu - 1st Graduation will be $19.99, and $9.99 for the soundtrack, Sound Disc. 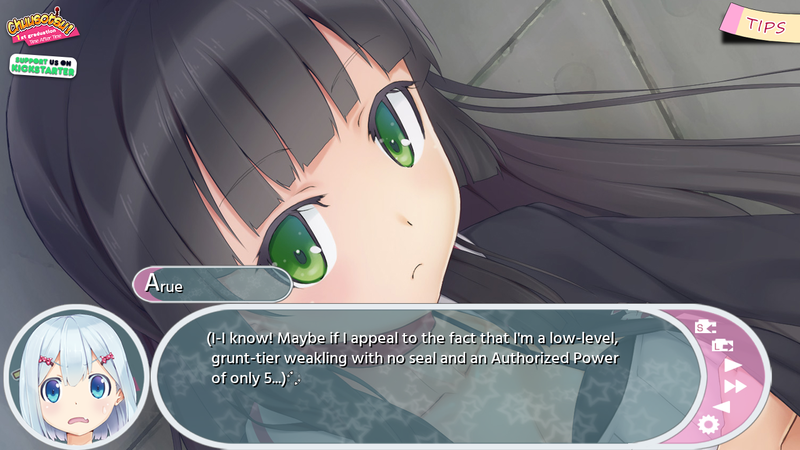 ), grab exclusive backer rewards, as well as support the localization of more great Japanese visual novels and help their authors create more games. We will be using BackerKit for the campaign, enabling accurate collection of shipping fees, as well as giving you more options to increase the pledge, acquire Add-ons, etc., even after the campaign ends. BackerKit access is included in all pledge levels. What makes a wonderful life? Synchronize your minds and philosophize on this proposition. "There's no way failures like us can do philosophy..."
Wait, could Arue actually be... in a pinch!? The radio waves are strong here. A flying girl? In my room? Despite being an autonomous AI, she is not autonomous in the slightest. Her job is to be the adviser to the three girls. Elite high school girl No.1. Froit is a slow-tempo, big-hearted, big-sister type of girl. She started her friendship with Yung through a letter exchange. She is currently into experimenting with her self-established psychoanalysis on other people. She touches other girls a lot. Elite high school girl No.2. She's the always-cheerful Froit's underclassman. Yung viciously clamps down on any dirty scumbag who looks at her adored big sis Froit with perverted eyes. She may literally bite them, which makes her a bit of a dangerous specimen. Her body is quite sensitive, and her back gives out on her from time to time. 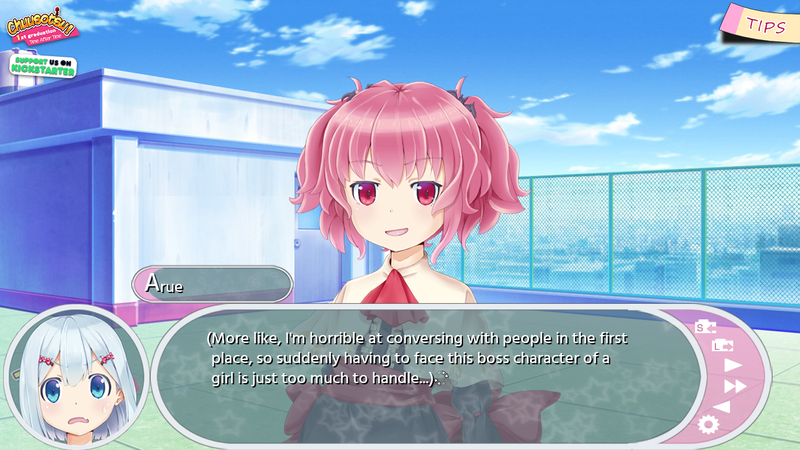 Here are the first translated in-game screenshots from Chuusotsu - 1st Graduation. You can click on the pictures to see them in full size. Suddenly - a boss encounter!? Second stretch goal unlocked! 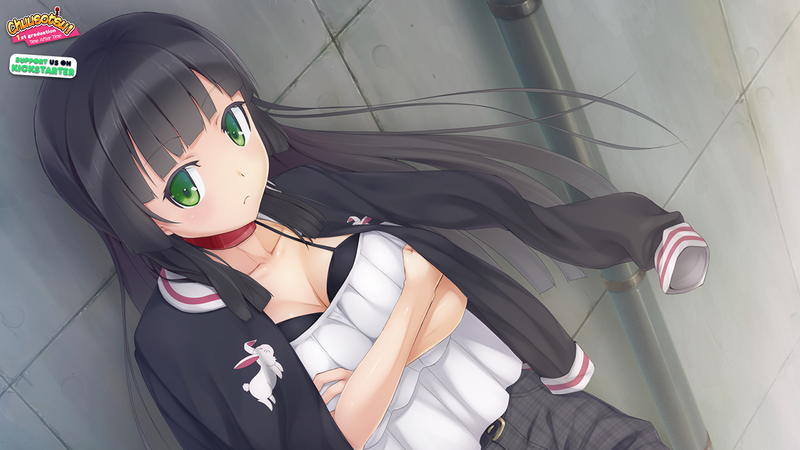 All 4 new CGs rewards from this campaign are open! --UPDATE (28/05/2017)-- First stretch goal unlocked! A new event artwork will be added to the game! 200+ supporters reached on Thunderclap, we have unlocked the second social goal as well! Two all-new event CGs will be added to the game for free! We are now funded! Time to go for those stretch goals! --UPDATE (17/05/2017)-- 100+ supporters reached on Thunderclap, free event CG unlocked! At 200 supporters, a second CG will be added for free! --UPDATE (10/05/2017)-- Thunderclap campaign is now live with a Social Stretch Goal - if 100 supporters sign up, a new event CG will be added to the game for free! Our campaign goal will allow us to give the game all the polish it deserves before release. If the funding exceeds the goal, we will be working with Studio Beast to add all-new event CGs to the game, as well as other exciting features! If the event CG stretch goals are met, we will next raise funding for an all-new side story Studio Beast will make for Chuusotsu, called Chuusotsu - 1.5th Graduation: The Moving Castle. The side story is expected to be 1-2h in length and introduce a new character. If the stretch goal is met, the side story will be added to every tier that includes the game for free. The next stretch goal after that will raise funding for a new opening Studio Beast wishes to make a for Chuusotsu - 1st Graduation. If even that stretch goal is met, the final planned stretch goal will be for the production of a limited physical edition version of the Artbook. By taking part in the campaign and spreading the word, you'll have a chance to pick up highly exclusive limited goods, support the creators and help us bring you more amazing games from Japan. Part of the funding goes directly to Studio Beast for the production of new art and other features. If we raise a higher amount, we will be able to put significantly more manpower into polishing the game even further. Shipping for a single add-on will cost an estimated $5-15, less if ordering several items. It will be collected in BackerKit after the campaign is over. Shipping is FREE for all add-ons for backers of $75 tier and above. To pledge on add-ons, simply add the sum to your pledge and specify which items you want in the BackerKit survey after the campaign ends. All the physical rewards are Kickstarter exclusive with the exception of the physical copy of the Sound Disc, which has been distributed at events in Japan, and you may not be able to acquire them anywhere outside of the campaign. Most of their artwork is created for this campaign alone, and the items will not exist unless the campaign succeeds. Extras will only be offered directly via our website and at events. Please see more details below. *All the art and designs in the preview picture are subject to change. Here's an early draft of the art for the stick posters included in the $75 tier and above. They will feature cool all-new art Studio Beast is creating for the Kickstarter campaign! (Final versions will be colored). Here's an early draft of the new key art that will be used in the poster! The final full-colored version is planned to be set in a park filled with cherry blossoms. Here is a preview of the colorful B2-sized wall scroll, featuring a cheerful beach scene! Please note that this is only a preview and final product is subject to change. The dakimakura included in White Rabbit tier and above features a character decided by the audience. Arue, the manga-loving protagonist of Chuusotsu, won the poll we ran on Prefundia asking which character you would like to see included in this tier. The dakimakura includes covers only, pillow not included. A set of 3 keychains featuring the main cast of Chuusotsu: Arue, Arara and Koiro. A digital Artbook featuring event art, new Kickstarter graphics, never before seen sketches and more! In dual language (English and Japanese). *all items seen above in the printed goods section are works in progress and there may be some changes during production. The following are our current rough estimates for shipping and will change depending on factors such as number of items shipped to each region. We will collect required shipping info via Kickstarter survey after the campaign is finished. That info will be used to confirm the actual shipping costs, which will then be charged separately using BackerKit. The estimate should cover the shipping costs to all parts of the world, but we may be able to offer cheaper shipping to specific countries, and shipping costs will be collected in BackerKit as accurately as possible. Unfortunately, due to import laws and customs, WE CAN NOT SHIP TO: Ukraine, Kazakhstan, Afghanistan and Russia, so please note this regarding the physical rewards. The localization of Chuusotsu - 1st Graduation is already underway, and we expect to release the game in late 2017. Physical rewards are expected to ship by the end of 2017. Interweave Productions LLC. is assisting us on the campaign's U.S. based operations, with Fruitbat Factory responsible for running the campaign and delivering the rewards. Nice to meet you all. We are Studio Beast, an indie game development group. 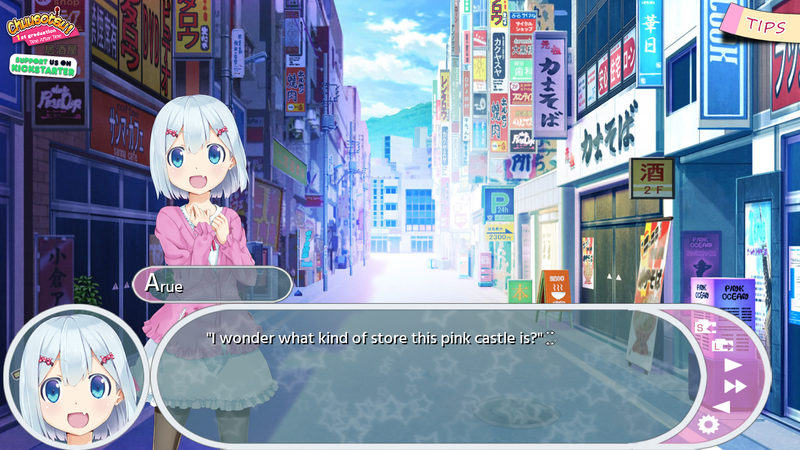 In contrast to most of our games that fall into the category of adult-oriented visual novels, “Chuusotsu” is developed as an all-ages game because we wanted as many people as possible to enjoy it. The story is a combination of comedy and the usual internal conflicts and worries that most boys and girls in puberty go through. As the second part of game’s title “1st graduation” points out, this is the first chapter in the Chuusotsu series, but it’s been written so it can be enjoyed all by itself. We are confident that the game will be liked by not only fans of our past works like “JQV” but also by female readers. We hope all of you have a fun time finding out how the story of the chuusotsu trio unfolds. Hi all, it's Studio Beast again. Thank you for visiting the Chuusotsu Kickstarter. Also, we really appreciate all of those who have backed the campaign so far! It's been a big pleasant surprise to us for the campaign to have already been funded this much. We didn't see anything like this coming at all. In addition to that, we are very encouraged by the fact that a lot of people outside Japan are paying attention to Chuusotsu, which is not such a famous title in Japan. We are considering more surprises besides the current rewards. Please stay tuned! Last but not least, we are strongly hoping to see the campaign succeed and share the excitement with you all. Studio Beast is a Japan-based doujin game circle best known for J.Q.V Jinrui Kyuusai-bu ~With Love from Isotope~. They have been complimented for their consistently high quality writing, which is supported by beautiful artwork. Chuusotsu! 1st Graduation - time after time is Studio Beast's 4th game release. They are currently working on their 10th year anniversary project, a new game by the name of Suicide Fence. 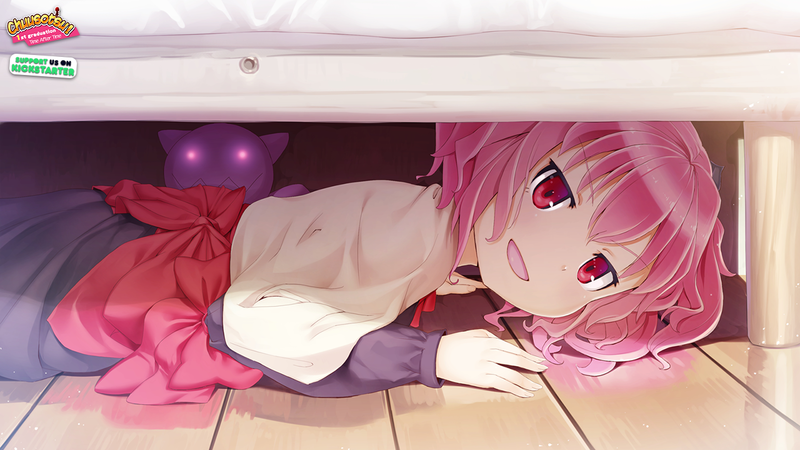 In operation since 2012, Fruitbat Factory publishes interesting Japanese games of all genres. We are best known as the publisher of the online board game 100% Orange Juice. Our other releases include Eiyuu Senki - The World Conquest for PlayStation 3, ENIGMA:, Miniature Garden, Magical Eyes - Red is for Anguish, QP Shooting - Dangerous! !, Xmas Shooting - Scramble! !, 200% Mixed Juice, Sora, ManaCollect, 99 Spirits, and the War of the Human Tanks series. We are also in charge of the localization of Little Busters! for VisualArt's. Chuusotsu -1st Graduation is being translated in-house, with GareJei (Tokyo Babel, Himawari - The Sunflower, SeaBed, Dies Irae) lending us his editing expertise in bringing the literary style of the game to life. You can follow us on Twitter and Facebook, and join our Discord server to talk to us directly! We are already in the process of localizing the game and will release it regardless of the success of the campaign. Therefore, the delivery of the main item - the game itself - is not at any risk, save for acts of God. This is our first project on Kickstarter, so we may run into something unexpected along the way. We have however run a successful crowdfunding campaign on another platform before, so we have a fairly good idea of what to expect. We are committed to making a quality release, and as such we can't sign an absolute release date beforehand. If we see that more work needs to be done, we'll do it even if it means pushing back the schedule. Depending on the campaign's success, Studio Beast also has various improvements thought out for the game, which may end up taking additional time. It is also possible we will encounter unforeseen delays in the manufacturing or shipping of reward items, or need to change related service providers. To sum it up, delays in delivery are the most likely risk in this project. Please treat any dates seen in the project as reasonable estimates. Join the party! Follow our project updates and talk to us and other backers in the Updates and Comments sections of the campaign. Support Personnel tier + DRM-free digital copy and Steam key of the localized game. Digital copy of the localized game + Steam key. Special limited tier for the fastest backers. Authorization Seal tier + digital copy of the official soundtrack, Sound Disc. Digital copy of the Sound Disc. Authorization Seal tier + digital copy of the official soundtrack, Sound Disc + Kickstarter exclusive digital background & avatar pack. Chuusotsu tier + have your name added to game credits. Synchronization tier + set of 3 exclusive character stick posters of the main cast. Keep Case, Game DVD, Sound Disc Soundtrack CD, Custom USB Flash Drive Card with the game and 3 Exclusive Postcards. Neighbor tier + signed physical copy of the soundtrack, Sound Disc. Synchronization tier + set of 3 signed, exclusive character stick posters of the main cast + signed physical copy of the soundtrack, Sound Disc + B2-sized exclusive poster with new key art. White Rabbit tier for the fastest backers! World-Type tier + B2-sized exclusive fabric wall scroll of a beach scene + 2-sided exclusive Dakimakura (body pillow) of the manga-loving protagonist, Arue + Limited Physical Collector's Edition. Special tier for the final week of the campaign!